Smackdown this week was an interesting show as each segment seemed very self-contained and had no impact on the rest of the show, however it looked like WWE were putting the wheels in motion for a number of future feuds for the next Pay Per View, Payback and we received two championship matches, albeit one being cut very short. 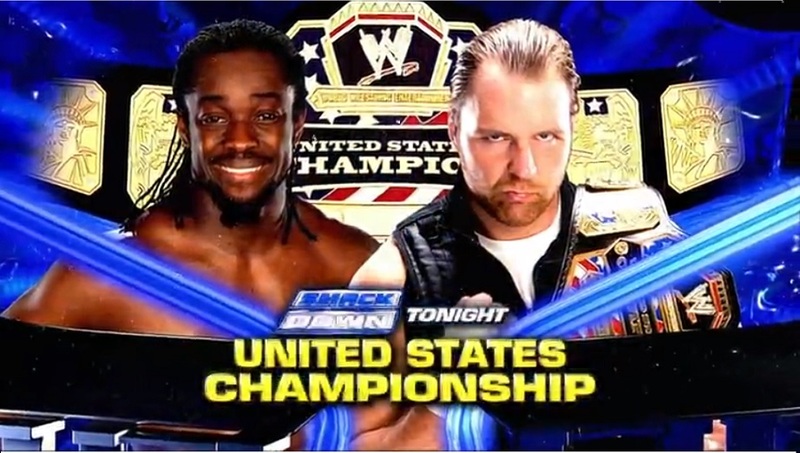 The original match here for the United States Championship wasn’t much to write home about, which was a shame because the contest between these two at Extreme Rules was one of the highlights of the show. It wasn’t helped by the fact it was cut so short to start the six man tag match, but Kofi Kingston’s awkward middle rope axe handle didn’t show much promise as they simply seemed to be waiting for the interference from the other member of The Shield, WWE Tag Team Champions Seth Rollins and Roman Reigns. The Shield continued to beat down Kingston until Sheamus and Randy Orton made the run in save. It seems pretty obvious where this storyline will heading from now on, with Sheamus and Orton getting a title shot in the near future, one can only think Orton’s now expected heel turn can only be so far away, with the ideal setting for a Sheamus-Orton show down being the biggest party of the Summer, Summerslam. Of course after the interference, it was only a matter of time before Teddy Long realised there was an equal number of faces and heels in the ring and headed onto the entrance stage to make a SIX MAN TAG TEAM MATCH! The contest itself was, of course, another very good contest for The Shield. WWE seems to have got these Six Man Tags down to a fine art with the pacing of these matches as well as the booking of The Shield as a whole being some of WWE’s best work in the last few years. They even managed to fit in a major false finish, with a Brogue Kick from Sheamus on Rollins, followed by a Spear to Sheamus from Reigns, who consequently got hit with an RKO on the outside. With Sheamus reaching for the hot tag to Kofi Kingston who hit a spectacular spring board cross body on Dean Ambrose, it genuinely looked like it could have been over for The Shield. With the fact that this was Smackdown and it was unlikely WWE would have their hottest commodity lose on this show was a testament to how hard all the six of these men worked during this bout. Dean Ambrose eventually picked up the win for his team, with his new finishing move, which is yet to receive a name on television. The only cause concern during this match was Roman Reigns, who appeared to injure his ankle on the outside, and limped throughout the rest of the match. Strangely the camera’s kept showing the injury, but it didn’t seem as if it was part of the story of the match. Hopefully it was merely a sprain as The Shield losing a member to injury so early could pop that bubble of momentum they have going forward. I’m sorry but I still find it impossible to take The Miz seriously as a fan favourite. The guy is simply naturally unlikeable and seems uncomfortable in the role, awkwardly trying to get the fans to cheer for him. Miz TV continued the storyline from Raw, where Fandango cost him and Wade Barrett a tag team match versus Chris Jericho and The Miz, and Jericho danced with Summer Rae. It was quickly interrupted by Intercontinental Champion Wade Barrett. I don’t if it’s because I’m British but I find Barrett instantly more likeable than Miz. He doesn’t shy away from a fight and doesn’t mince his words, going straight to the point. Therefore once Miz and Barrett get into a physical confrontation into their planned Intercontinental Title fight, I’m feeling no sympathy for the smarmy Miz. The match itself was a solid contest which we’ve seen these two are capable of on the Post-Wrestlemania Raw. With Fandango on commentary, the match continued to go back and forth between the two, including an impressive big boot from The Miz, until Fandango decided it was time to dance with Summer Rae at ringside. I’ve heard a number of people complaining about this as well as the similar moment on Monday Night, however I think if you’re complaining about the dancing, then Fandango is doing his job well! A number of false finishes followed as both competitors got distracted by Fandango, in quick section of the match which really seemed to get the crowd going. This was until The Miz had enough of the ringside antics and hit a double footed dive to the outside. It didn’t take long for Fandango to retaliate which led to the Disqualification ending. Fandango and Barrett then continued to beat down Miz, and for a while it looked like a very strange new tag team was about to form. That is until Barrett hit the ballroom dancer with a Bullhammer Elbow. Personally, I think this is the most exciting the Intercontinental Championship picture has been in a very long time, with a number of superstars going after the prize, which can only act as to raise the profile of the belt on television, and in return the superstars that hold the belt. WWE seems to have finally realised that they have more than just the WWE and World Heavyweight Championships to play with and have made clear efforts as of late to bring the Intercontinental and United States Championships back to prominence on their main television shows. The newest Paul Heyman guy, Curtis Axel previously Michael McGillicutty and before that Joe Hennig, also turned up on the blue brand this week. Of course, Axel’s manager, Heyman was also there for a rare appearance on the show. Heyman cut an interesting and intelligent promo about his past successes and how he is going to do the same with Axel before handing the microphone to Axel, who it seems has improved his mic skills since his days on NXT Season Two. Curtis buried his father and grandfather before claiming to have caused Triple H’s concussion at the end of Raw on Monday. It was an obnoxious promo and will go a good way in the continued build of Axel towards supposed main event stardom. A match with Sin Cara followed soon after. I’d like to know why Sin Cara still gets the treatment with the strange lighting during his match. I’m pretty sure it’s never been explained on television why this happens and it’s incredibly distracting during his match and has clearly done very little in helping Sin Cara get over. The match here was a nice quick TV contest with Sin Cara looking the slick in the ring and getting the majority of the offence in, until he missed a cross body and was hit with Axel’s spinning neckbreaker finish. I’m interested to see how WWE continue to build Curtis Axel as he does have the potential to be a major star for the company, especially with heat magnet Paul Heyman by his side. The Team Hell No storyline continued with Daniel Bryan out to prove he is not the weak link, to who is trying to prove this is unknown. Bryan is arguably the most universally over superstars on the roster with both young kids and seasoned wrestling fans cheering him on and joining in with “YES” celebration. Bryan faced Jack Swagger, although there was no Zeb Colter promo pre-match as the character has gone off the boil as of late, with the controversial statements that made the character so entertaining and detestable in the first place being watered down, if WWE aren’t going to fully go for the gimmick then there isn’t much point it being there, however it does seem like Swagger could finally be getting his punishment for his extracurricular activity earlier in the year. The contest was certainly not as good as it could have been, considering the in-ring ability of both competitors, because of the time constraints it was more or less each man’s regular spots as they went through the motions in this contest. With Bryan picking up the win with the No Lock, it seems Swagger is destined to drift back down the card for the foreseeable future. After the match, Bryan continuing the hold after the match, with Kane having to physically break the hold. With Sheamus and Orton seemingly in line for a Tag Team Title shot, could we about to see the disintegration of Team Hell No? At first, I was confused by WWE opting to have Chris Jericho face The Big Show on Smackdown, it seemed like a waste of what could be a good Pay-Per-View contest given the proper storyline, which with the past history of these two as Jeri-Show wouldn’t be two hard to do. Big Show has had some of the best match of his career in the last year and this was another solid outing for the World’s Largest Athlete with Jericho also proving his worth to WWE as of late, helping to manoeuvre Dolph Ziggler and Fandango into higher spots on the card, and the two manage to put on another stellar contest with the classic Big Man Vs. Small Man thread running throughout the match. With neither man being able to afford a loss at the moment, it seemed obvious the match would head to a Dusty finish and as expected Jericho won the match via Countout after a Codebreaker on the outside send Show over the barricade. In many ways, what happened after the contest was more interesting than the match with Show attempted to gain revenge on Y2J with a steel chair only for Jericho to reverse and beat down the Giant. Surely this is leading to a contest at WWE’s next Pay per View, Payback? There was also a very strange segment involving Damien Sandow, Matt Striker, Sheamus and a knot. Sandow produced a solid promo which was as always a joy to listen to, about the contest between Sheamus and Mark Henry on Smackdown in recent weeks, which seemed out of place as Sandow was clearly seen cheering on Mark Henry in the truck pull on last week’s show! It continued with some goofy idea about being able to undo a knot, which neither Striker nor Sheamus could undo. Sandow produced bolt cutter to undo the knot, before dodging a Brogue Kick from Sheamus, only to have Matt Striker thrown in him. This whole segments seemed pretty pointless, as it doesn’t seem like the two will be entering a feud anytime soon, especially as the ending to the show with Orton and Sheamus turning up to face the Shield. This was a fairly entertaining episode of Smackdown, which seemed to have more consequence than it has in recent weeks, with new feuds and stories developing, instead of just being a throwaway continuation of Raw. It was nice to see both the Intercontinental and United States Championships placed in prominent positions on the card, but the show was harmed by the absence of both World Heavyweight Champion Dolph Ziggler and his number one contender Alberto Del Rio. I understand Ziggler is suffering from a concussion and Del Rio appeared on both Raw and Main Event, but Smackdown is supposed to be their brand and there wasn’t even a mention of either of the Superstars.